In a sports column last Wednesday [“Students Blow Away the Stress”], an editing error removed attribution from a quotation. The statement “You don’t have to be born with agility or strength to succeed in pistol. 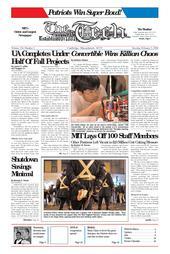 This... attracts a lot of students,” belongs to MIT Pistol Coach Will Hart. Because of an editing error, a table of admissions statistics on page 21 last Wednesday gave incorrect figures for the number of freshmen enrolled in the classes of 2003 and 2004. There were 1,048 and 1,012 students, respectively, not one student in each.